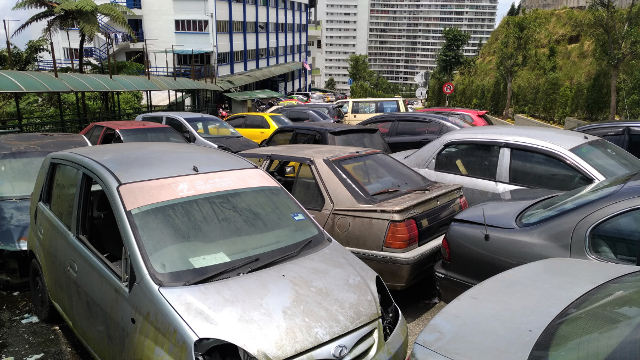 Readers with a memory like no other may remember my pre-WindowSeatPreferred trip to Genting, Malaysia’s most famous cold, concrete mountain peak. Well – it’s closing in on nearly a decade since I was last there, and so it seemed only apt after 5.5 years of living back in Malaysia, to give it one more go; and what better way to come down from these past few weeks of hectic premium travel! Truth be told, I did intend to visit sooner based on the new theme park that I had heard was due to open pretty much every year since I returned and yet still hasn’t. Latest reports are that 20th Century Fox are either trying to, or have fully pulled out. 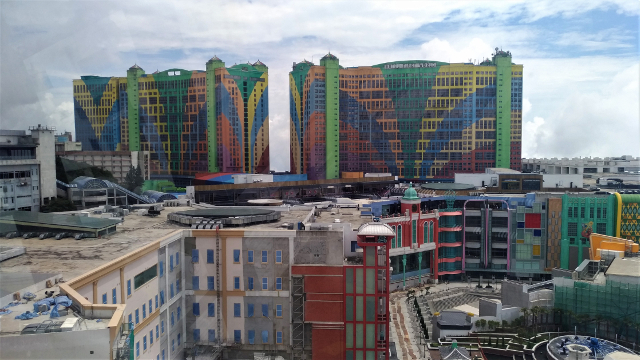 The rumour here in Malaysia is that it was down to Genting having a casino and a slightly more ‘adult’ tone than other Disney-owned properties. The rumour elsewhere however is that they grew irritated that it was taking so long and overdue for completion. Where do we begin? 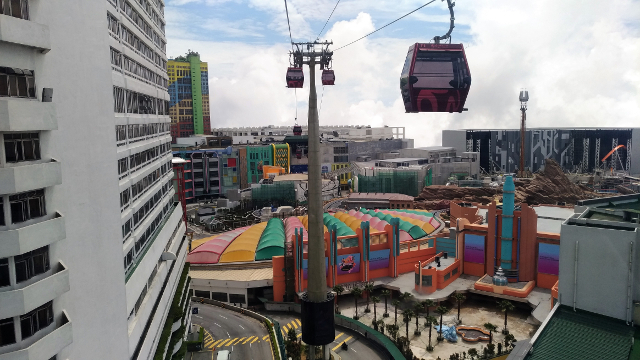 The intervening years at least have seen the opening of a new, slightly less-terrifying cable car system, the ‘Awana Skyway’. It comes complete with a security screening checkpoint, which I’m pretty sure has no merit whatsoever considering there is no X-ray for your bags – just a long wheel runner, and a metal detector that I got casually waved through. The views on the cable car however, are pretty spectacular. 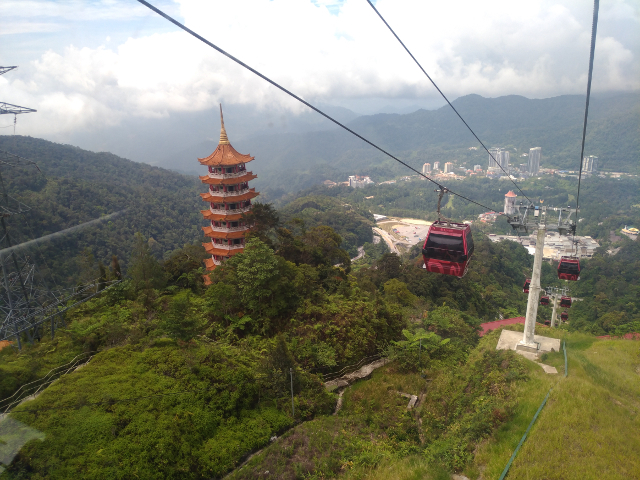 On the way up, we went for the glass floor gondola, through which you can see the ground below. My key advice is; do it if you can, but make sure you don’t drink too much the night before (thankfully, I hadn’t – just about). 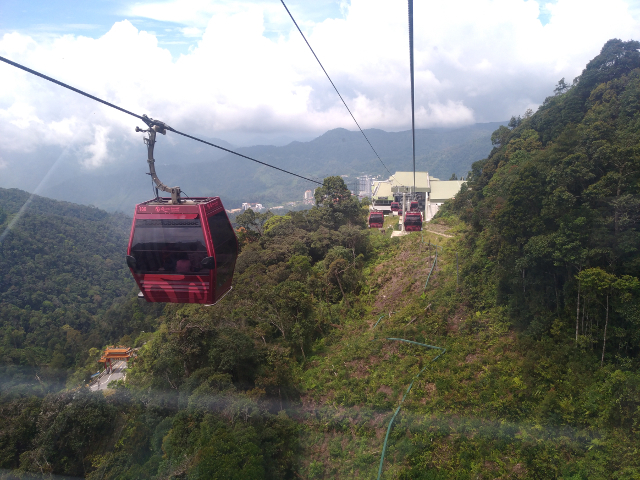 As we ascended higher and higher, closer to the peak, my biggest issue with Genting came back fully into view – can you guess? Hint – the total, sheer ugliness of the place. Reaching the mountain peak aaaand…hideous! I wouldn’t call myself an environmentalist or a naturist by any stretch, but to lop off the top of a mountain and then construct such absolutely ghastly buildings seems such a crying shame, and I’m sure the whole place could have been built in a slightly classier way – even in the 70’s, which everything looks like it came straight from. On the plus side, the indoor shopping experience has improved dramatically from the hideous faux-Venice interior my senses were confronted with last time – now the main arrivals area from the skyway consist of a whole series of wraparound screens and an odd light show in one corner, which is quite impressive (my overactive imagination made me dread to think how much time went into programming the entire sequence of dancing lightbulbs). 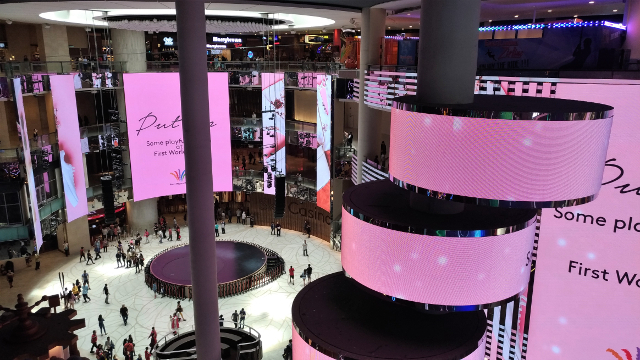 The indoor theme park – formerly full of junk that kept breaking down it seemed – has been improved pretty majorly and now runs through the middle of the huge shopping centre all the way down to the absolutely frightfully painted First World Hotel. 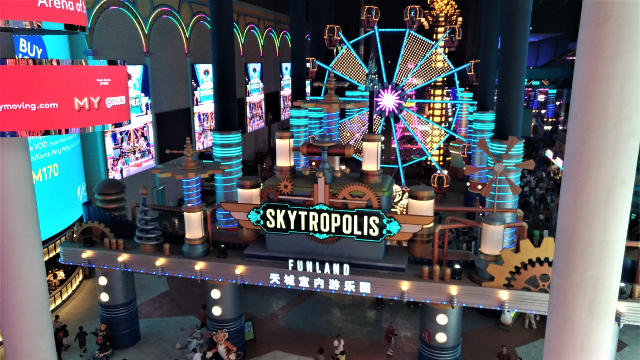 It really does look significantly improved – although being honest, it still comprises attractions you could surely find at a nearby fairground. Moving along, lovers of the indoors will not be disappointed to hear that there is still no clear escape path outdoors from the whole complex; the only way we could source an exit point was by – yes – walking through the antiquated tunnel system I mentioned nearly a full decade ago and following them for as long as possible, before turning up unexpectedly right out by the car park on the pavement beside the main road in. 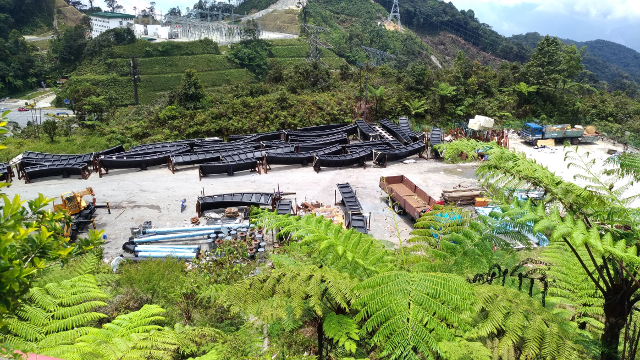 Genting always seems such a major shame to me the moment I step outdoors and this time was no different. You’re standing there, in a cool climate, on the top of a mountain – and yet you can barely see anything for the garish hotels and buildings on one side, and – which I had not seen before – the abandoned car lot, police station and staff accommodation blocks on the other. Overall, the fact that there is nearly no nature path or walkway whatsoever seems such a lost opportunity to capture more visitors who may want a walk and then head for a meal/drink afterwards. On the walk around another point became pretty abundantly clear; work on the new – no-longer 20th Century Fox-themed – theme park has all but completely stopped. Barely anything was happening there at all, while around the back of the park, there were heaps of roller coaster and ride track sections sitting unloved, barely fenced-off and guarded by a single incredibly bored looking guard. 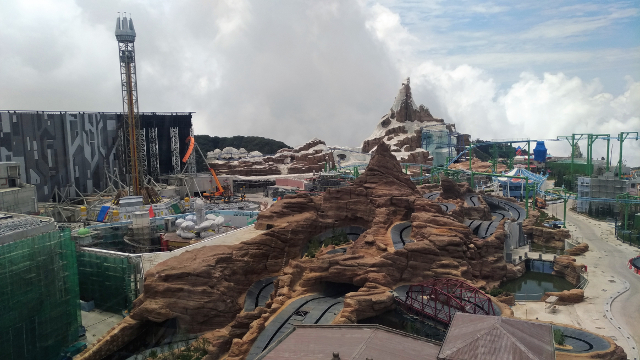 One thing’s for sure – I wouldn’t hold my breath on when this park is likely to open. I could well be back in Ireland retired by then. 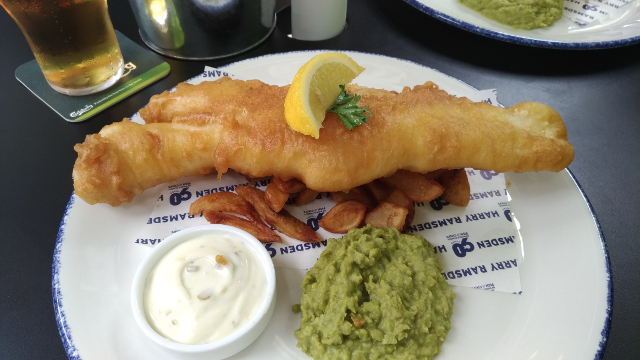 Back indoors and to the final redeeming factor of the day; a British-themed pub, The Laughing Fish, which did amazingly good fish & chips. And, as an added bonus, it was outdoors. See, it’s not all complaining?